FixMyPC is an application that most probably will not fix your PC and will not boost it as promised by its promotional website. On the contrary, it might present you with certain virtual security issues. Since this software itself is not a dangerous malware infection, we dubbed it a PUP, a potentially unwanted program. While this category may have a ring to it that suggests that it is okay to keep such a program on-board, we would like to emphasize that even the slightest chance of being introduced to unsafe web content or malicious programs indirectly is enough for you to cause damage to your computer. Therefore, we believe that your PC is more secure if you remove FixMyPC. The longer you keep an unreliable application on your system, the more time it has to start operating unexpectedly. There is little chance that you find the official website at tweakbit.com/fix-my-pc unless you know about TweakBit products and search for this PUP by its name on the web. But, if you simply look for a PC optimizer product, it is not very likely that you end up on this website. If you check the other applications under the Products menu, you will see that the company, Auslogics Pty Ltd., offers eight “different” products that seemingly do exactly the same under different names. Why would you need eight applications to speed up, clean and secure your PC, when you can do all that with a single program? What’s more, FixMyPC seems to have an original price of $239.40, which appears to be way too much for the service you get from this tool even if it is sold at $59.40 right now. As a matter of fact, we have found that this program simply removes junk files and empty registry keys, but nothing “fancy,” no deep scan whatsoever. Nevertheless, it completes its system scan within 10 seconds. Let us repeat this for emphasis: 10 seconds! Is that not mind-blowing and, perhaps, time-bending at the same time? Of course, you need to know that the usual speed for professional software is around half an hour to do a proper system scan. Do you think it is possible that this TweakBit product can tweak time a bit, too? We certainly do not think so. It is more likely that the initial scan results are more or less made up to “scare” the user to buy the full version so that he or she can fix those alleged errors. Since we have found this PUP unreliable, we suggest that you delete FixMyPC from your computer. Since this PUP is most likely to be distributed in free software packages that may contain several malware programs, chances are that your computer has already been under attack and more vulnerable to cyber criminals than you might think. That is why you should take action now and eliminate all the threats. As a first step in the process of making your computer a safe “haven” again, it would be best to uninstall FixMyPC via Control Panel. If you are ready to take care of this infection manually, please use our guide below for assistance. As for the remainder of the threats, we would advise you to use a trustworthy antimalware tool that can automatically tackle all existing security issues on your PC and protect it from future attacks. 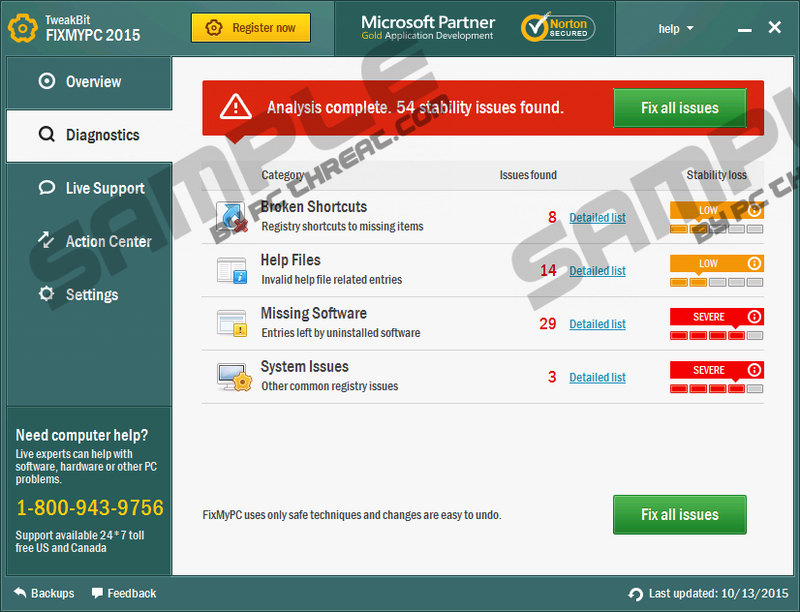 Quick & tested solution for FixMyPC removal.